Red blood cells have a normal life span of approximately 90-120 days, at which time the old cells are destroyed and replaced by the body's natural processes. Hemolytic anemia is a disorder in which the red blood cells are destroyed prematurely. The cells are broken down at a faster rate than the bone marrow can produce new cells. Hemoglobin, the component of red blood cells that carries oxygen, is released when these cells are destroyed. As a group, anemias (conditions in which the number of red blood cells or the amount of hemoglobin in them is below normal) are the most common blood disorders. Hemolytic anemias, which result from the increased destruction of red blood cells, are less common than anemias caused by excessive blood loss or by decreased hemoglobin or red cell production. Since a number of factors can increase red blood cell destruction, hemolytic anemias are generally identified by the disorder that brings about the premature destruction. Those disorders are classified as either inherited or acquired. Inherited hemolytic anemias are caused by inborn defects in components of the red blood cells—the cell membrane, the enzymes, or the hemoglobin. Acquired hemolytic anemias are those that result from various other causes. With this type, red cells are produced normally, but are prematurely destroyed because of damage that occurs to them in the circulation. Inherited hemolytic anemias involve conditions that interfere with normal red blood cell production. 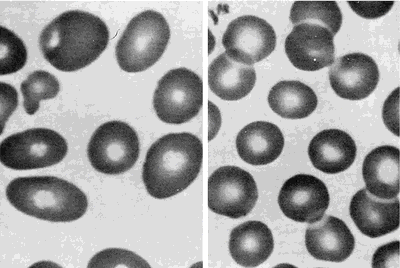 Disorders that affect the red blood cell membrane include hereditary spherocytosis, in which the normally disk-shaped red cells become spherical, and hereditary elliptocytosis, in which the cells are oval, rather than disk-shaped. Other hereditary conditions that cause hemolytic anemia include disorders of the hemoglobin, such as sickle cell anemia and thalassemia, and red blood cell enzyme deficiencies, such as G6PD deficiency. The causes of acquired hemolytic anemias vary, but the most common are responses to certain medications and infections. Medications may cause the body to develop antibodies that bind to the red blood cells and cause their destruction in the spleen. Immune hemolytic anemia most commonly involves antibodies that react against the red blood cells at body temperature (warm-antibody hemolytic anemia), which can cause premature destruction of the cells. About 20% of hemolytic anemias caused by warm antibodies come from diseases such as lymphocytic leukemia, 10% from an autoimmune disease, and others are drug-induced. Cold-antibody hemolytic anemia is a condition in which the antibodies react with the red blood cells at a temperature below that of normal body temperature. Red blood cells can also receive mechanical damage as they circulate through the blood vessels. Aneurysms, artificial heart valves, or very high blood pressure can cause the red cells to break up and release their contents. In addition, hemolytic anemia may be caused by a condition called hypersplenism, in which a large, overactive spleen rapidly destroys red blood cells. Major symptoms of hemolytic anemias are similar to those for all anemias, including shortness of breath; noticeable increase in heart rate, especially with exertion; fatigue; pale appearance; and dark urine. A yellow tint, or jaundice, may be seen in the skin or eyes of hemolytic anemia patients. Examination may also show an enlarged spleen. A more emergent symptom of hemolytic anemia is pain in the upper abdomen. Severe anemia is indicated if there are signs of heart failure or an enlarged liver. In order to differentiate hemolytic anemia from others, physicians will examine the blood for the number of young red blood cells, since the number of young cells is increased in hemolytic anemia. The physician will also examine the abdominal area to check for spleen or liver enlargement. If the physician knows the duration of hemolysis, it may also help differentiate between types of anemia. There are a number of other indications that can be obtained from blood samples that will help a physician screen for hemolytic anemia. An antiglobulin (Coomb's) test may be performed as the initial screening exam after determining hemolysis. In the case of immune hemolytic anemia, a direct Coomb's test is almost always positive. Treatment will depend on the cause of the anemia, and may involve treatment of the underlying cause. If the hemolytic anemia was brought on by hereditary spherocytosis, the spleen may be removed. Corticosteroid medications, or adrenal steroids, may be effective, especially in hemolytic anemia due to antibodies. If the cause of the disorder is a medication, the medication should be stopped. When anemia is severe in conditions such as sickle cell anemia and thalassemia, blood transfusions may be indicated. Hemolytic anemias are seldom fatal. However, if left untreated, hemolytic anemia can lead to heart failure or liver complications. Hemolytic anemia due to inherited disorders can not be prevented. Acquired hemolytic anemia may be prevented if the underlying disorder is managed properly. American Autoimmune Related Diseases Association, Inc. Focus: A quarterly newsletter of the AARDA. Detroit, MI. (313) 371-8600. http://www.aarda.org. The American Society of Hematology. 1200 19th Street NW, Suite 300, Washington, DC 20036-2422. (202) 857-1118. http://www.hematology.org. Antibody — Antibodies are parts of the immune system which counteract or eliminate foreign substances or antigens. Erythrocyte — The name for red blood cells or red blood corpuscles. These components of the blood are responsible for carrying oxygen to tissues and removing carbon dioxide from tissues. Hemolysis — The process of breaking down of red blood cells. As the cells are destroyed, hemoglobin, the component of red blood cells which carries the oxygen, is liberated. Thalassemia — One of a group of inherited blood disorders characterized by a defect in the metabolism of hemoglobin, or the portion of the red blood cells that transports oxygen throughout the blood stream. pertaining to, characterized by, or producing hemolysis. hemolytic anemia anemia caused by the increased destruction of erythrocytes. A frequently fatal type occurs in infants as a result of Rh incompatibility with the mother's blood (see Rh factor and erythroblastosis fetalis). Other types result from mismatched blood transfusions; from industrial poisons such as benzene, trinitrotoluene (TNT), or aniline; and from hypersensitivity to certain antibiotics and tranquilizers (drug-induced hemolytic anemia). Another important cause is mechanical obstruction caused by microvascular or valvular abnormalities. In addition, it sometimes occurs as a result of a disorder of the immune response in which B-cell–produced antibodies fail to recognize the body's own erythrocytes and directly attack and destroy them (autoimmune hemolytic anemia). Finally, some types of hemolytic anemia appear in the course of other diseases such as leukemia, hodgkin's disease, other types of cancer, acute alcoholism, and liver diseases. Along with the usual symptoms of anemia, the patient may exhibit jaundice. If the cause of the condition can be determined, and if it can be successfully treated, there is a good chance of recovery. steroids and transfusion therapy are used to treat some types. In other cases, surgical removal of the spleen may bring about great improvement. hemolytic disease of newborn erythroblastosis fetalis. hemolytic jaundice a rare, chronic, and generally hereditary disease characterized by periods of excessive hemolysis due to abnormal fragility of the erythrocytes, which are small and spheroidal. It is accompanied by enlargement of the spleen and by jaundice. The hereditary form is also known as familial acholuric jaundice; there is also a rare acquired form. See also hyperbilirubinemia. hemolytic uremic syndrome a form of thrombotic microangiopathy with renal failure, hemolytic anemia, and severe thrombocytopenia and purpura, usually seen in children but occurring at any age. Some authorities consider it identical to thrombotic thrombocytopenic purpura. any anemia resulting from an increased rate of erythrocyte destruction. Anemia resulting from the lysis of red blood cells, as in response to certain toxic or infectious agents and in certain inherited blood disorders. a disorder characterized by acute or chronic premature destruction of red blood cells. Anemia may be partially compensated by bone marrow production. The condition may be associated with some infectious diseases, certain inherited red cell disorders, or neoplastic diseases. It may be a response to drugs or other toxic agents. Also spelled haemolytic anemia. Compare aplastic anemia, congenital nonspherocytic hemolytic anemia, iron deficiency anemia, myelophthisic anemia. See also anemia, hemolysis, spherocytosis. Hematology Anemia which occurs when more RBCs are lysed than are produced; HA may be immune-mediated or non-immune, due to intrinsic or extrinsic RBC defects. See Nonimmune hemolytic anemia Immunology Immune hemolysis is alloimmune, autoimmune, and drug-induced, and may be intravascular or extravascular Microbiology Hemolysis is characteristic of certain strains of streptococci and is divided into α- and β-hemolysis; γ 'hemolysis' is a complete misnomer. See Gamma-hemolysis, Innocent bystander hemolysis. Anemia due to increased rate of erythrocyte destruction. anemia caused by the increased destruction of erythrocytes which may occur in the vascular system—intravascular hemolysis, or due to phagocytosis by the monocyte-macrophage system—extravascular or intracellular hemolysis. It may result from incompatibility (see alloimmune hemolytic anemia of the newborn), from mismatched blood transfusions, from poisons such as copper, organic agents in plants such as kale, from nutritional deficiencies such as phosphorus and from protozoan infections such as babesiosis. Hemolytic anemia may also occur as a result of a disorder of the immune response in which B cell-produced antibodies fail to recognize erythrocytes that are 'self' and directly attack and destroy them. In addition to the usual signs of anemia, the patient may also exhibit jaundice. a degree of extravascular hemolysis in association with other types of anemia. a little reported disease recorded mostly in Australia in sheep, cattle and foals; a highly fatal hemolytic anemia associated with a heavy population of Clostridium perfringens type A in the intestines. a microangiopathic hemolytic anemia with thrombocytopenia and severe involvement of renal vasculature which leads to acute renal failure. In humans associated with verocytoxin-producing bacteria such as Escherichia coli, Shigella and some Salmonella; usually associated with the ingestion of poorly cooked meat. A similar clinical syndrome has been reported in cows, horses and dogs. Use of intravenous gamma globulin for the treatment of autoimmune neutropenia of childhood and autoimmune hemolytic anemia. Jaundice was seen in all cases of Hemolytic anemia. We report the case of a 28-year-old woman with endocarditis of PDA containing large vegetation that complicated with hemolytic anemia referred from a general hospital to our center. Autoimmune hemolytic anemia and idiopathic thrombocytopenic purpura in pediatric solid organ transplant recipients, report of five cases and review of the literature. A person was considered to have anemia if anemia or hemolytic anemia was recorded in the chart. Intolerance to leprosy multi-drug therapy: more common in women? Autoimmune complications are common in CLL and by far the most common manifestation is autoimmune hemolytic anemia (AIHA), followed by immune thrombocytopenia (ITP) and pure red cell aplasia (PRCA). 1] methylprednisolone (MDMP) for their patient with autoimmune hemolytic anemia without improvement, and after 3 weeks of steroid treatment splenic infarct developed. The main purpose of this study is to evaluate the awareness of community pharmacists about drugs that are contraindicated with flucose-6-phosphae dehydrogenase (G6PD) deficiency patients, and resulted in serious hemolytic anemia. Corticosteroid therapy for hemolytic anemia and respiratory failure due to Mycoplasma pneumoniae pneumonia.